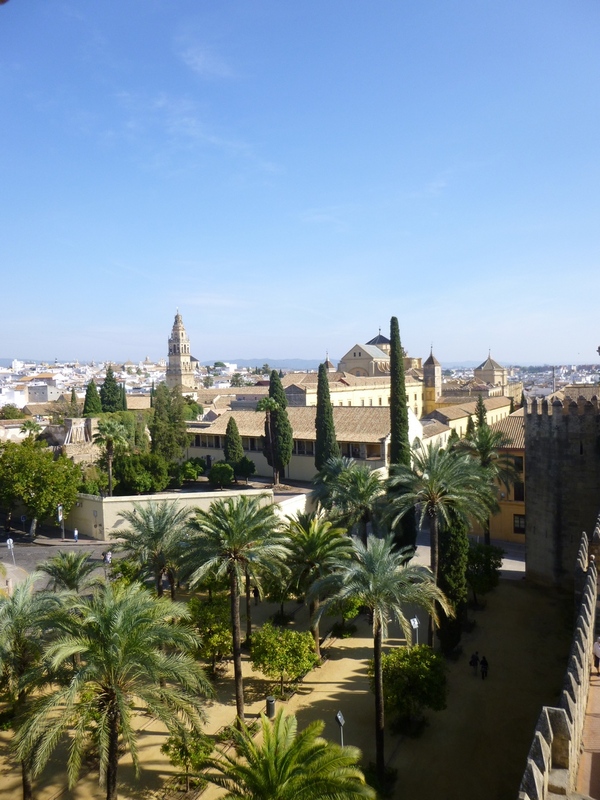 The final stop of our Spanish journey takes us to Cordoba, formerly the capital of the Moorish state of Al-Andalus. The most famous site (justly so) in Cordoba is the Mezquita, a mosque that was transformed into a cathedral hundreds of years ago when the Christians reconquered Spain from its Muslim rulers. But Cordoba also has its own Alcazar, a castle with "delightful gardens". To be honest, I'd say that if you find yourself in Cordoba, you should skip the Alcazar. The interior is bare (or covered in pigeon dung) and the gardens (as with the ones in Granada and Sevilla) seemed overrated to me. By and large, I found the Alcazar gardens of Cordoba just as dull as the other famous Spanish gardens we visited. As with the others, hedges were ominpresent in this garden, although here at least some were trimmed into whimsical topiary shapes. I did like the cheerful bed of French Marigolds (Tagetes patula, I presume) encircling the vase. Interestingly, despite its name, I just discovered that "French" Marigolds, as well as "African" Marigolds, are both native to Mexico and Central America! Pretty blue flowers. They looked a little like phlox, but I think this was growing on a bushy vine that covered a wall. Can phlox do that? 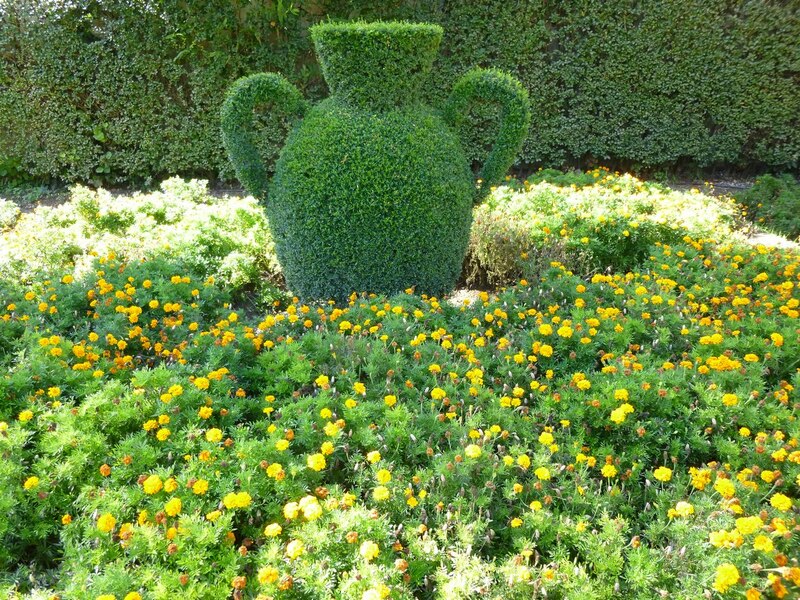 Sadly, none of the plants in Cordoba's Alcazar garden had markers to identify them by name. 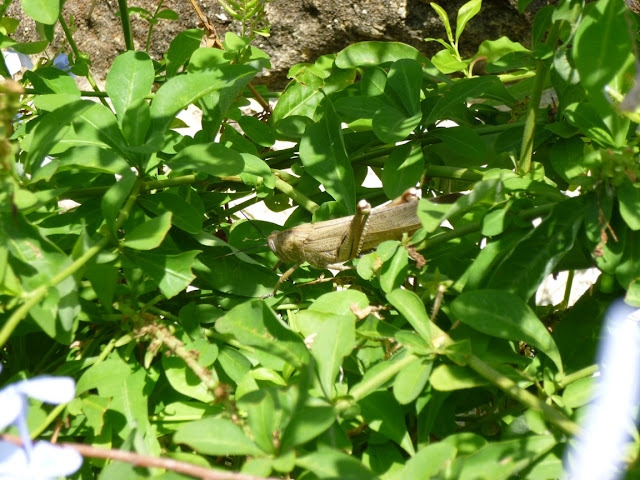 My wife leaned in close to the phlox plant, and there among the foliage we spotted this very large grasshopper. 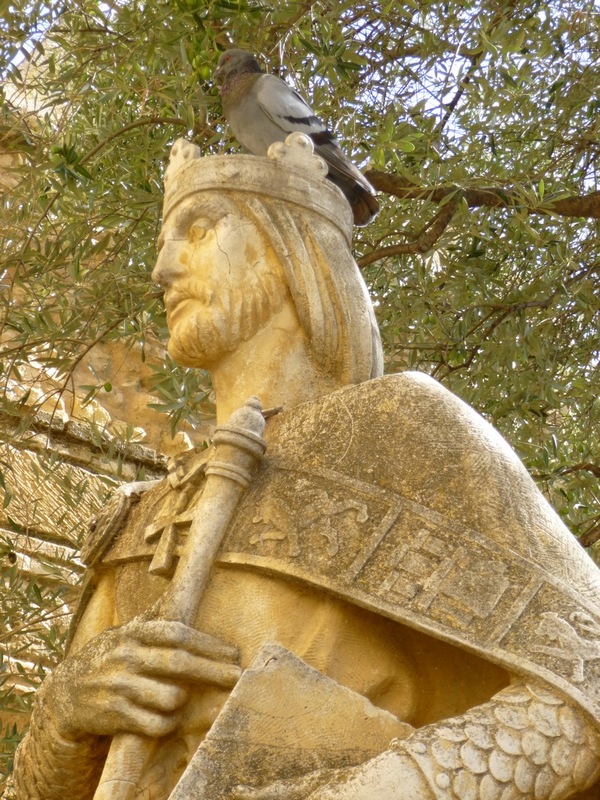 This kingly statue tries to project an air of power and authority, but this pigeon is not impressed. 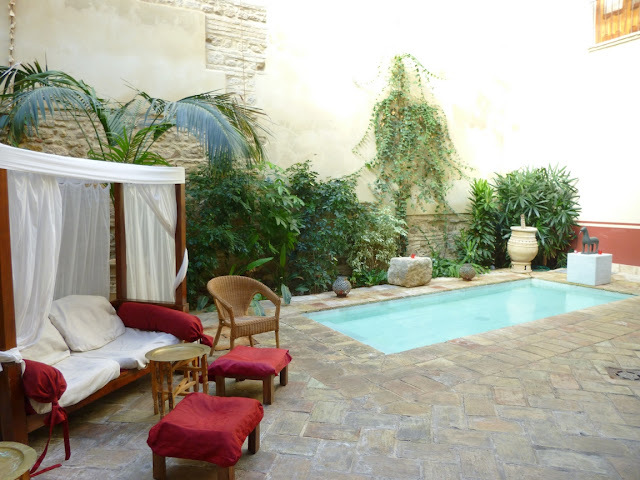 None of the plants or landscaping here were necessarily all that special, but I wanted to include this photo from our Cordoba hotel - Hospederia Banos Arabes de Cordoba - simply because it did show the Spanish taste for courtyard gardens. In this case, the garden contains a small plunge pool and curtained sofa. Do you have a courtyard garden in your home? Or have you seen other courtyard gardens that you admired? I feel there is something very nice about having a private and enclosed garden, somewhat protected from the elements, easily accessed from many parts of a home. I wish that courtyard garden design was more prominent in U.S. housing customs. Get all the latest updates at Garden of Aaron (typically 3x per week) with an email subscription. 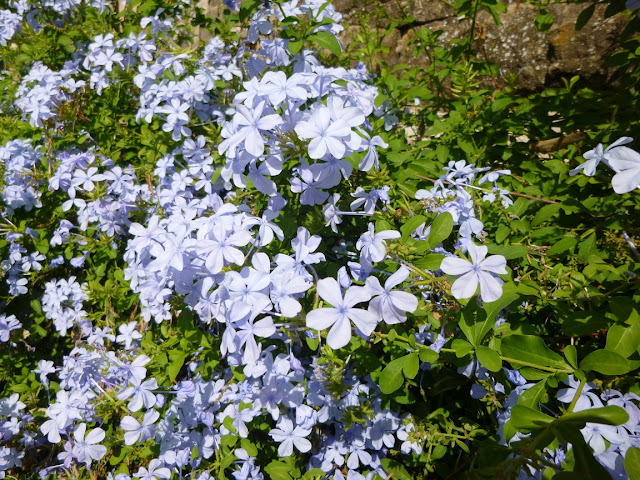 The pretty blue phlox-like climber is plumbago. Thanks for the comment, Laurrie. Spain was very interesting in other ways - the tapas bars, the flamenco dancers in Seville, the Prado art museum and the Goya Chapel in Madrid, etc. But yes, I think you've hit the nail on the head - the gardens of Spain seemed very uninspired to me. I think it is plumbago auriculata which you see all over Hawaii and in warmer semi tropics. I grow it as a rambler trained up a pyramid, but it can be kept shrubbier. It's not hardy (only to zone 8), so I have to treat it as an annual (or dig it up and bring it inside each winter). But I do that each year because it it a beautiful plant! I dug them up and overwintered them on an unheated porch (not inside the heated house) and they did not survive. Bought new ones again the next year. I also dug those up and am overwintering them in pots on the porch and we'll have to see if they make it this time! I may just have to keep buying them each year as an annual. It is too bad we don't have more courtyard gardens in the US although I see them frequently in the SW US...here in the NE they just don't seem practical with nature. I love the courtyard garden! And I love clipped hedges and statuary, so I would probably have liked this garden. But I think it all has to do with expectation. If you love clipped hedges and statuary, get thee to Spain! (Although I have to tell you I never saw such odd hedge-trimming as I did in Spain. Maybe it's the economic situation there or maybe the gardeners have their own iconoclastic way of doing things, but a lot of times I would see tall hedges/evergreen trees pruned only half-way or two-thirds to the top. So the sides would be narrow and smooth, and the tops would be bushy and wild. The overall effect was rather (unintentionally?) comical! Laurie is right; this is Plumbago. I grow it every year, but I have to take mine into the greenhouse to overwinter. I've had a white variety, too, but the blue is by far the prettiest. I usually buy the plants, but Chiltern Seeds in England sells the seeds. I'm sure other places do, too, but I happen to have their catalog handly. I've enjoyed your series of Spanish gardens. Thanks Dottie. Based on all the positive comments, I'll certainly consider growing this climbing plumbago someday. Happy to hear you enjoy this blog-based tour of Spanish gardens! I hear ya. Not a huge fan of the cold myself. At least the sun has *finally* returned here today after an interminable period (OK, maybe a week) of gloom. Even if it's in the 30s, the sun makes it feel cheerful and warm inside! I'm so happy to have popped over here! I spent a month in Spain, back in 2001. Driving all the backroads and seeing some amazing sights. It's an incredible country. Really enjoyed these photos! Happy New Year! Which Garden Bloggers Should I Read in 2013? War or Peace in the Garden?